Estate sales in the USA are rather like having an open house to sell your house contents. An Estate Sales company manages promotion and financial logistics and people come fro all over to buy anything from cutlery, screwdrivers to dining room suites. They seem to happen as standard for middle-class-wish homes. A way of downsizing before moving into retirement homes, following an elderly person’s death. 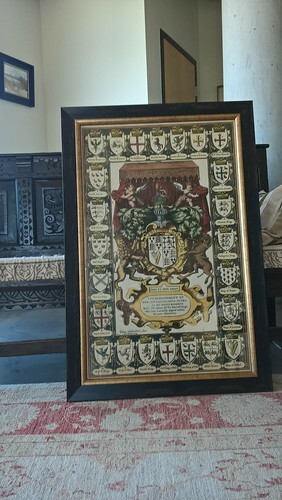 I picked up this 4ft x 2ft scaled-up reproduction of a front-piece to a 1614 map by “John Speed” for $20. Bargain! The glass and fame are probably each worth more than that!